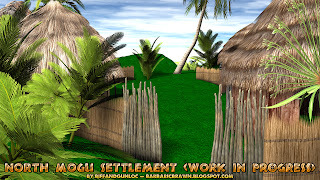 About two hours north of the bountiful M'waku River stands the newly-established settlement built by journeymen for the eventual expansion of the main village of Mogu. The Mogu are a moderately-sized tribe of African natives comprised of warriors, hunters and gatherers, medicine men, and laborers. 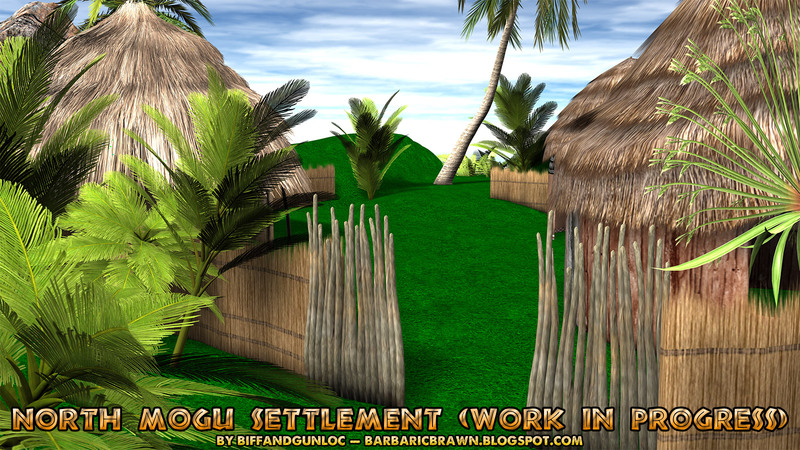 The North Mogu Settlement is the location where my next story begins. It's currently a work in progress (along with the valley where the fight takes place), so certain things may be tweaked or changed between now and its completion. Since this next series will not be a quick battle, I'm going a little slower and crafting it more carefully. which program do you use to craft these amazing environments? if so how much did you need to purchase within the program to make them? I use DAZ Studio for placement and rendering, Hexagon for simple things like loincloths and arm bands, and Bryce for the skies, mountains, and terrains. All are currently free at www.daz3d.com. As for how much you'd need to invest really depends on when you buy the premade models and props. I've gotten quite a bit of mine on sale (either with coupons or just normal discounts), and there are a lot of free repositories out there for things like textures or props. Thank you so much, finally I can make things for my people in DAZ with Hexagon. You're welcome! I have to warn you, though, Hexagon can be very frustrating at times (it's free, after all, so that's the price to pay, I suppose), but it does work when you get the feel of things. Also, make sure to save your work often. I'd suggest saving as different files every now and then, like File Version 1, File Version 2, etc, just to make it easier in case you need to go back and change something. There are tutorials on YouTube about how to model in Hexagon. When you play around with it and get to know the basics, what you do is go into DAZ and make the figure you want to clothe, set all of its positions to 0, and then in File, select Send to Hexagon. It'll open Hexagon and load the figure you're working on. Then you can begin to shape the loincloth around his hips and mold it to his form. When you finish, delete the figure, leaving only the loincloth. Then you can export it as a Wavefront OBJ file and finally import that back into DAZ. It takes a lot of trial and error -- and I'm certainly not an expert -- but if you give it some time and patience, it can do some nice simple things for a beginner. I made Tarzan's and He-Man's loincloths (and He-Man's wrist bands) with Hexagon. Thank you so much you've been such a help. actually haha, sorry about all the questions, the internet is proving monumentally unhelpful. So there is an option to send to DAZ from hexagon, should I do that? I did what you said and saved it as an OBJ file, then went to DAZ and imported it but I didn't see anything. Is there a place where you can look for it and then add it in when you want? Also what about when my character moves? is there a way to treat this like a regular piece of clothing so that it kind of moves with him a bit or is that way to complicated for just hexagon? How did you go about that when making so many different scenes with clothes. I've found sometimes that when you import the OBJ file, it'll sometimes be super tiny (I'm sure that's my fault, though -- still learning how it all works, myself). What I do when that happens is to find it in the Scene tab, click it, and then change its base scale (in Pose & Animate) to 1000%. If that makes yours too big, try adjusting the scale sliders to see how it looks. When you get it how you like it, drag it onto your all-stats-zeroed figure's hips to parent it to him. Now, when you pose him or rotate/turn him in different directions, the cloth will stay static, but it'll move with him. And as for more complex movement, I think it can be done with Hexagon, but unfortunately it's outside my range of knowledge for now. It's definitely something I want to learn how to do, but for now I can't help with that. Again you are awesome. Better than anything on the internet. I'm really sorry for all my questions because I know that this isn't what your blog is for. It is all trial and error but it sometimes is easier to ask someone whose run into these errors before so you don't make them yourself. Just two questions left and I they are much smaller. Parenting--does it do it automatically or do you need to do something to do that? Texture-- how did you do it in Hexagon, because I gave mine a color but when I imported it it did not have a color anymore. I don't mind much. *smile* I'm not an expert yet, so I'm hoping that I'm making enough sense. There are a couple different ways to do this. The quickest way is to move the item you want to parent into the place you need it to be and right click it in the Viewport or in the Scene tab and click "Change Parent..." Select the hip node in the list and click Accept. This will move the item directly onto the hip in the Scene list. You can still move the item around freely, but it'll stay parented to the hip unless you decide to unparent it later. As for textures, select the item to texture; go into the Surfaces (Color) tab under Actors, Wardrobe, & Props; select it in the list to the left and in Diffuse Color you can either place an image on it or change its color there. If you need to increase the tiling (so the image you select doesn't look stretched), find the Horizontal and Vertical Tiles sliders in the list and increase them by the same amount. Hopefully this helps you out! Just play around with the different settings and use the Spot Render tool (the icon looks like a camera with a mouse icon over it) to see what your changes look like as you do them. Is there a chance for Tarzan to be bound after the fight? If you mean bound as in ropes or chains, probably not.